The village Karterados is situated 2km south east of Fira and is the closest village to the airport in Santorini. The village is a very traditional looking one with many vineyards and historical Santorini architecture. The colourful gardens and flowers create a very relaxing and charming setting. For the travellers visiting this village there are plenty of traditional tavernas and restaurants, and also a few bars and cafes where you can enjoy a relaxing drink. There are two beautiful white washed churches in Karterados. 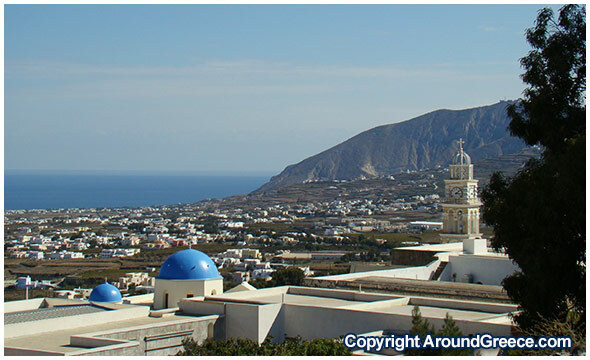 One church is called Eisodia tis Theotokou and the other is Agios Nikolaos. The beach alonside the village of Karterados is very quiet and picturesque and is the perfect place for a relaxing swim or to soak up some of the famous Greek sunshine.